Foundation Bolts are type of industrial fasteners that are highly coveted in the market and prove to be particularly significant for different industrial functions. 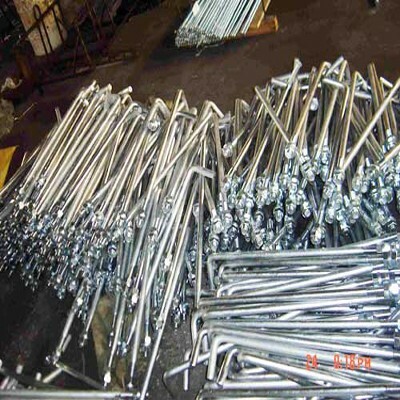 In order to fulfil the requirements and standards of various clients, we make use of high grade raw materials that is especially procured by our vendors in the market. Being a reckoned firm in India, we only deal in premium array of Foundation Bolts that ranges from M12 to M100 upto 3000mm in length. Also, these bolts are prepared as per the customer’s requirements in high grade raw materials like carbon steel (Gr8.8), mild steel, Alloy Steel (Gr10.9 and Gr12.9) and stainless steel (SS202, SS304, SS316). Consequently, Dhankot Traders is listed as one of the reliable Manufacturers, Exporters and Wholesale Foundation Bolts Suppliers from Chennai (Tamil Nadu), India.